In 1987 we visited Yellowstone National Park. I hadn’t been to the park since I was a teenager, and it was great to show the wonders of the place to my two little boys. The next summer, Yellowstone experienced one of its worst fires. I remember how sad I was that such a beautiful place could have suffered such devastation. A couple of years later we revisited Yellowstone. Hillsides after hillsides, acres upon acres still sat upright like shaved heads covered with dust and ashes. Like mourning mothers. But out of the ashes I saw tiny sprigs. New growth. A couple of summers passed. By now our three children were in elementary and middle school. They barely remembered what the park had looked like shortly after the 1988 fire. “Why are the trees so small, Mommy?” My eight year old daughter asked. “Because they’re very young. They are the new growth after the bad fire. Another decade passed. Now my kids were grown and married, and it was just Bruce and I. We drove through Yellowstone again, and stopped to view the geysers, eat at Old Faithful Lodge, and hike some of the trails. On one of the trails I pushed my body through scores of young trees growing so close together they seemed like a huddle of teenaged boys playing football. I stood in their midst and enjoyed the delicious pine scent and the tickling of their needles against my hands and face. I said to myself, these trees are just youngsters, born of the fire. While the heat of the fire was scorching and destroying the old trees, it was also making the pine cones open, showering the seeds, burying them underneath the fiery debris that would shelter and nourish them. Until the season of cool, and rain, then snow. A period of time that has to pass for all the processes to gestate a new tree. Yellowstone looked ugly for a couple of years. But during that time, Nature was re-building. Nature had burned, thrown out, tidied, cleaned out the dead and diseased parts. God does the same thing to us. He must tear down before He can re-build. For a while we feel awful and ugly because the old facade has been ripped away. As we wait for the new terrain to grow, we feel naked. I think this process happens many, many times in the lives of a Believer. 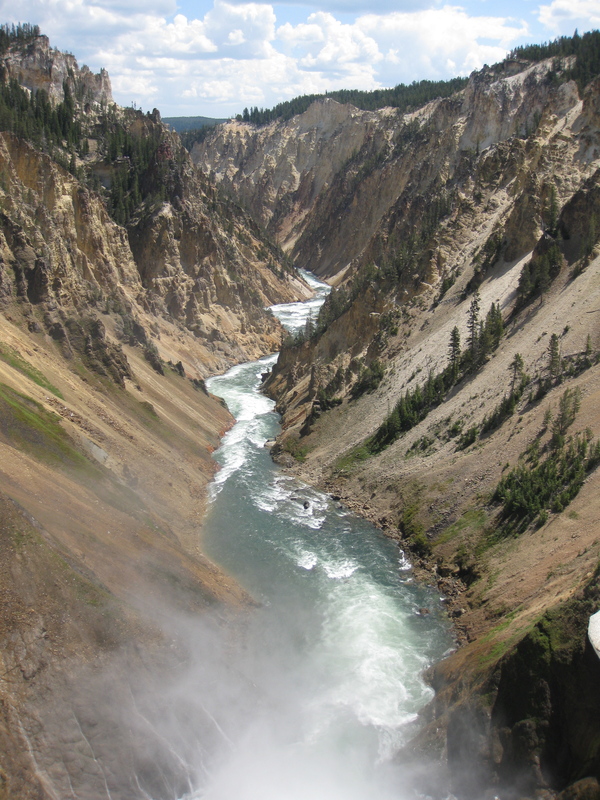 But take comfort in the story of Yellowstone. After her fire, she is more glorious than ever. A great LIFE reminder, Dena…needed that today…thank you!